PM SHEET T and TM are reflection crack absorbing sheets. 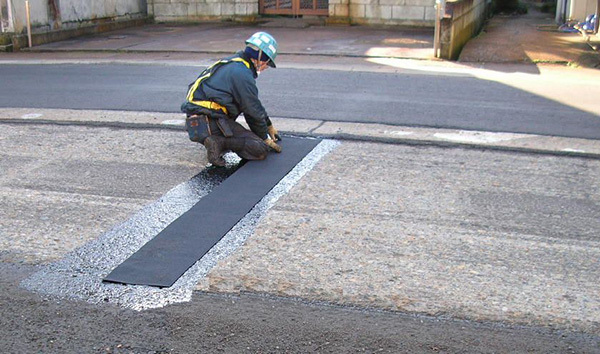 They consist of special asphalt that is highly waterproof and a high strength synthetic fiber unwoven cloth. PM SHEET T is for the road which heavy traffic volume 250 under. PM SHEET TM is for the road which heavy traffic volume 250 and more. Has outstanding flexibility, and adapts well to the paving surface. The shock absorbing effect is large, and it absorbs impact. The strength and expansion rate is large, so that it adapts to the behavior of the paving. Has outstanding waterproofing and water-tightness. Inhibition of reflection cracks for paving in which cracking has occurred. Inhibition of reflection cracking for joint parts of concrete paving in composite paving.